When you think of algae, you likely imagine the slimy green growth in a dirty-looking aquarium. Red algae are often shades of purple and red, and they can grow in the deep ocean. Some species are hard rather than slimy, with a beauty reminiscent of coral. Red algae play an important role in the development of coral reefs, providing homes for marine fish. Algae are plantlike organisms that use photosynthesis to produce their own food. While some species of algae resemble plants, they lack the roots, leaves and stems of higher plants. Algae are a kind of primitive plants, and it’s likely that higher plants -- like trees and flowers -- evolved from them. Algae can be small and only seen through a microscope (microalgae) or large enough to see with the naked eye (macroalgae). Macroalgae are colloquially called seaweed. There are more than 6,000 species of red algae. Red algae are part of phylum rhodophyta, which is Greek for red plant. They appear red because they contain pigments called phycoerythrins. These pigments absorb blue light and reflect red light, making them appear red. Not all species of red algae look red, however; they are commonly pink or purple, but can be orange, yellow or green. Like all algae, red algae depend on photosynthesis to produce food. Most varieties of algae live near the surface of the water in order to get enough sunlight to live. Since they can absorb blue light, red algae can live in much deeper water where light of long wavelengths -- like red -- can’t reach. Red algae have been found living in depths of over 500 feet. Some species of red algae are coralline algae and produce calcium carbonate in their cell walls. There are two types of red corallines. Articulated red coralline has branches with flexible joints. Crustose species resemble coral and don’t have branches, growing on rocks, plants or animals. Crustose algae can be found in deep water, up to 500 feet. 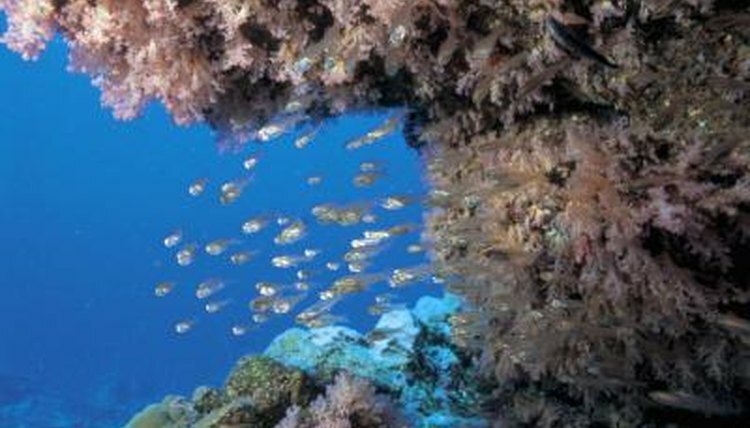 Coralline red algae grow very slowly, and most fish won’t eat them because of their hard texture. These coral-like algae help create coral reefs and provide homes and hideouts for fish. Aquatic Community: What is Algae?